Jonathan Safran Foer’s 2005 novel, Extremely Loud & Incredibly Close benefited from a great title and arresting cover design, but as a piece of writing it was as calculated as an XL spreadsheet. The device of telling the story through multiple voices owed a debt to Faulkner’s As I Lay Dying. The graphics and typographical games were straight out of Tristram Shandy. The tone of voice – and references to Dresden – had echoes of Kurt Vonnegut Jr. The lead character, a nine-year-old prodigy called Oskar Schell, was cousin to Oskar Matzerath, in Gunter Grass’s The Tin Drum. Where the first Oskar beats his drum, the second spends the entire book shaking a tambourine. British director, Stephen Daldry, who did such a superb job with the film adaptations of books such as The Hours (2002) and The Reader (2008), has managed to untangle Foer’s overly self-conscious creation. He has simplified the plot, bringing out depths and nuances that were missing in a noisy, fractured book. Daldry has been assisted by an astonishing performance from Thomas Horn. In his first film, at the age of fourteen, Horn never misses a beat as the precocious, hyper-active, hyper-phobic Oskar, self-styled inventor, jewellery designer, pacificist, entomologist, francophile, and a dozen other titles that don’t fit on to an already crowded business card. Tom Hanks and Sandra Bullock are the big names playing Oskar’s parents, but they are hardly more than supporting roles. 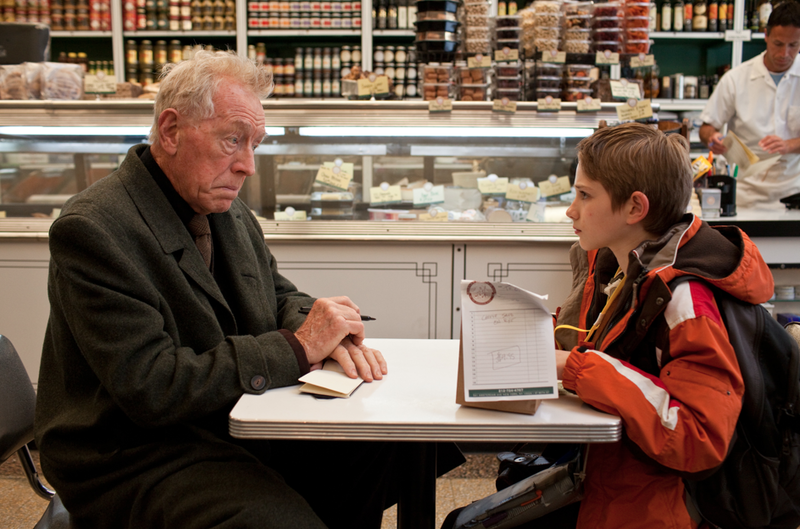 The other outstanding performance is by German veteran, Max Von Sydow, who only communicates with written notes. To succeed in a completely silent role requires more skill and stage craft than a speaking part, as facial and bodily movements have to tell us everything. The story, no matter contrived, has an intrinsic forward thrust. It is both a Homeric quest conducted in the boroughs of New York and a coming-of-age story. Oskar has lost his adored father, Thomas, in the disaster of 9/11. It was a favourite game of his father’s to set him tasks and investigations, and Oskar believes Thomas must have left some message behind. One year later, looking in his father’s wardrobe he finds a key in a tiny envelope with the word “Black” written on it. This leads to a systematic search in which he intends to visit every person named Black in the New York phone book. At his grandmother’s apartment he meets a mysterious silent old man only referred to as “the Renter”. He asks to accompany Oskar on his quest, and together they roam the streets. We realise pretty quickly that the Renter is actually Oskar’s long-lost grandfather, and that the questers are searching for both a father and a son. Conversely, Oskar sets out to look for his absent father, but finds both a grandfather and himself. It may sound as if the story is too cleverly structured for its own good, and this is certainly the case with the novel. However, Daldry makes use of all the resources of the cinema to bring this tale to life. The backdrop of 9/11, which seemed slightly exploitative in the book, takes on a sense of muted tragedy. The camera work is consistently dynamic, while Alexandre Desplat’s minimalist piano music keeps the momentum up. Oskar’s babble is balanced by those scenes in which his grief and anger rise uncontrollably to the surface. Instead of seeing Oskar as a purely literary creation, he becomes a figure of flesh-and-blood. Where Foer gave us a set of voices, Daldry has human beings. In this sense it is surprising to find how many reviewers have found Oskar to be merely irritating. Surely the whole point is that he combines an obsessive, over-active intelligence with a profound emotional disturbance. There will be parents who recognise the type only too well.